Land clearing is now underway for the construction of the Berlin Central School’s Athletic Complex. It will feature a state of the art track with areas dedicated to field events, enclosing a soccer field. Located nearby the track nestled in a pine forest will be a new baseball field. Athletes, visitors, and residents will have an opportunity to use the track surrounded by the landscape of the beautiful Berlin Valley and Rensselaer Plateau. Residents of the Berlin Central School District approved the $9,358,000 capital building project and separate proposition for $3,667,000 on Tuesday, March 6. Proposition 1: Approved by a vote of 266 yes to 140 no. Improvements to the elementary and middle school/high school and an addition at the bus garage. Proposition 2: Approved by a vote of 217 yes to 188 no. Construction of a new running track, a new soccer field and a new baseball field at the Middle/High School. We would like to thank everyone in our community who came out to vote. 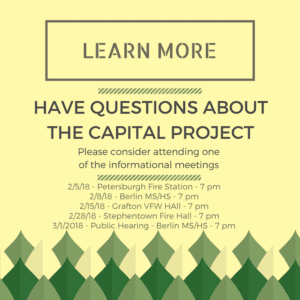 Feb 5 – Petersburgh Fire Station at 7 p.m.
Feb 8 – Berlin MS/HS at 7 p.m.
Feb 15 – Grafton VFW Hall at 7 p.m.
Feb 28 – Stephentown Fire Hall at 7 p.m.
Mar 1 – Public Hearing – Berlin MS/HS at 7 p.m.